We provide a consistently superior experience in landscaping, fertilizing, hardscape or snow plowing. No decision is made related to the design, execution and ongoing maintenance of your landscape property without first fully understanding your needs. The price of the low-cost contractor may seem right at first, but if you buy cheap, you get cheap. You will soon realize that corners have been cut which leads to an unattractive property. Cutting costs or forgoing work translates to higher costs down the road. Please read the blog section about contractors cutting corners. The quality of their work is evident. At first, the higher cost material and service they provide may seem worth the investment, but over time you’ll find yourself struggling to meet the budget due to the fact that the investment in landscaping has come at the expense of other areas. You will now be forced to make tough decisions on where to cut expenses. The right choice for the long term is not one based merely on cost. It is one that is based on partnership. Envision having a partner that ultimately becomes the eyes and ears of managing the look and feel of your properties. One that is always listening, always improving, a partner that has the devotion to proactively monitor market trends, a partner that has the market expertise to suggest ways in which these trends will ultimately impact your properties. Envision having a partner that isn’t just there to lay down the groundwork but is there with you, side-by-side helping with tough decisions in order to uphold the quality image. 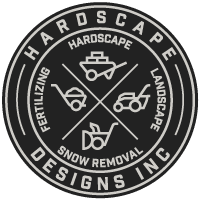 At Hardscape Designs, we rely on well-trained experts in our field. They listen to the customers and then fine-tune to match clientele needs with specific programs. Our knowledgeable staff will answer all your calls and address all your concerns. We will reply to any emails and voicemails within 24 hours or the next business day. We strive for perfection. We make every effort to complete all jobs to the customer’s full satisfaction. If the customer notices anything that is not to their liking, we will address it immediately. Many low-cost contractors do not have insurance. Hiring a company without liability insurance puts the property owner at risk of having to pay for damages and injuries that may happen while work is being completed.